← We have arrived in Paris! 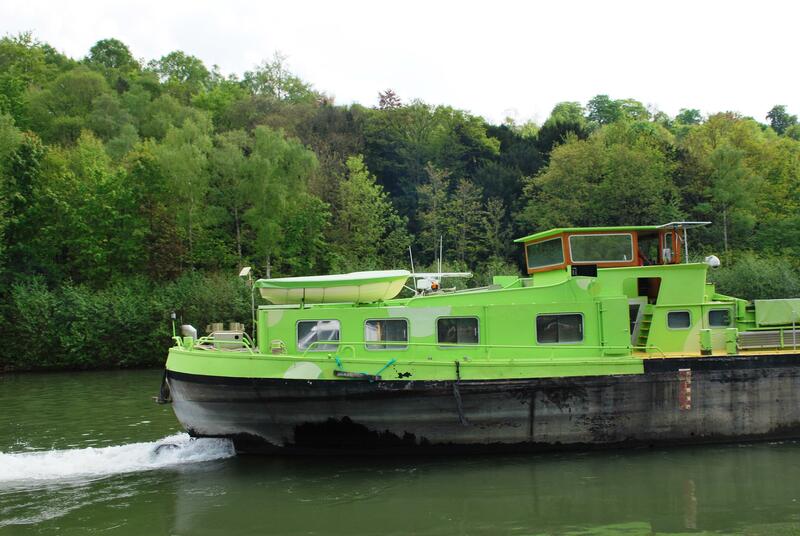 On Wednesday 23 April, when exiting Lock 4 at Creil, we ran aground. It happened suddenly. We went from doing 4 knots to a sudden stop. We have got stuck along the way a few times in mud, always when mooring or entering small harbours and it has never been a problem. We have always been able to work our way off. This time it was different! No matter what way I tried to move the boat, it was stuck. We called the lock keeper on the radio and informed him of our predicament. He told us that a barge was coming to our assistance. 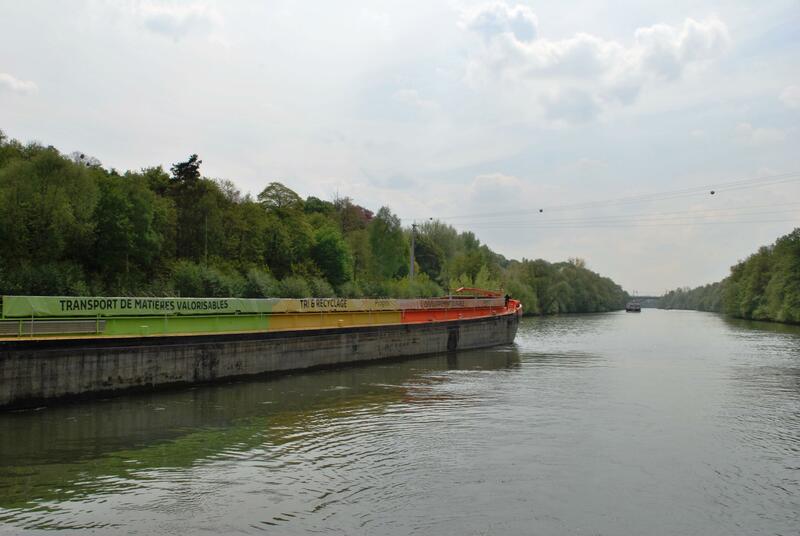 We assumed it would be the barge coming out of the lock, but no, this enormous barge, approx. 100 feet, came up river. It turned in the channel and the bow of the boat started to inch its way towards us. I got a rope ready on our stern and the wife of the barge man walked down the side of the barge. Under instructions from her husband in the wheel house, she attached our rope to a bollard on the side of the barge. With engine roaring he went into reverse and started to pull us. Nothing happened and our boat rope went as taut as a guitar string. 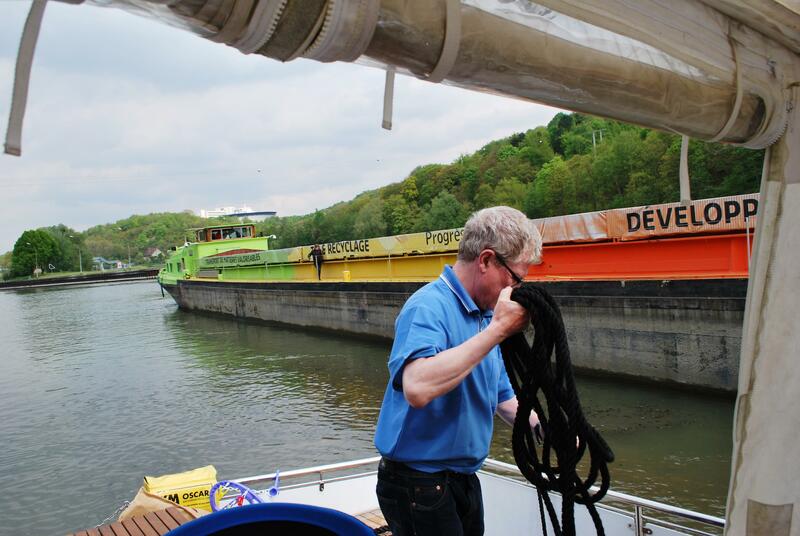 He stopped reversing, came forward again and changed the angle of the barge. Again he reversed with engines roaring and suddenly we were free! We were so grateful to them that we wanted to give them a present so Nuala ran downstairs and got out a bottle of Baileys which we passed over to them in a bag on a boat hook. Note for the dignity of the team we are not saying who was steering when the boat ran aground!! Barge pulling away after rescuing us! This entry was posted in C'est La Vie - The Boat, On the Journey, People We have Meet on the Gap Year, People who have helped us on our way and tagged Baileys, Creil, run aground. Bookmark the permalink. 5 Responses to We ran aground!! ah go on tell us who was at the wheel? we wont tell anyone!!! !, glad to hear ye are enjoying the trip and getting wonderful weather. Noel. Hi Noel. You know once you tell anyone its no longer a secret!!! – I am just telling you it was not me and yes we are still talking. Is this another example of ignoring the yellow warning markers, as we did on the shakedown cruise?? ?